The neighborhood of Carmel Views/Rancho Rio Vista is a quiet, peaceful neighborhood of homes that have spectacular ocean views westward to Point Lobos and tranquil rolling hills vistas to the east. Towering pines create a park-like setting, and homes here often have large lots and acreage for sunny outdoor living. A terrific neighborhood for families, homes here are part of the coveted Carmel Unified School District. The neighborhood of Carmel Views/Rancho Rio Vista is bordered by Outlook Drive to the north, Carmel Valley Road to the south, Canada Drive to the east and Carmel Knolls Drive to the west. Homes in this desirable Carmel neighborhood offer privacy and the restorative quality of country living, while still maintaining close proximity to the conveniences and sophistication of Carmel-by-the Sea, Pebble Beach and Monterey. Click here to view all Carmel homes for sale in the Carmel Views/Rancho Rio Vista neighborhood. For all available Carmel real estate, click here. 11 homes sold in this neighborhood in 2018. The most expensive home sold for 2.3 million for a 4 bedroom, 4 bathroom Comstock Adobe home with 2,878 SqFt of living space on 1.14 acres. The least expensive home sold for 890K for a 3 bedroom, 2 bathroom home with 1,600 SqFt of living space on a 10,890 SqFt lot. In 2017 10 homes sold in this neighborhood. 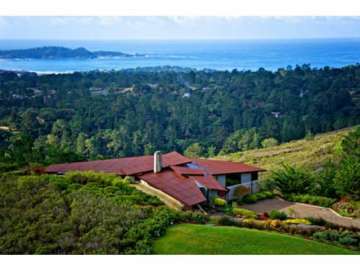 The most expensive home sold for 2.29 million for a 4 bedroom, 3.5 bathroom with 4,107 SqFt of living space on 1.35 acres with views of Pt.Lobos and bay and complete with a lap pool. The least expensive home sold for 930K for a 3 bedroom, 3.5 bathroom contemporary style with 2,064 SqFt of living space on 1.48 acres. 10 homes sold in this neighborhood in 2016. The most expensive home sold for 1.575 million and was a renovated 3,120 SqFt home with 4 bedrooms and 3 bathrooms on a half acre lot and sold for 1.575 million. The least expensive home sold for 865K and was a 3 bedroom, 2 bathroom, 1,748 SqFt home on a 9,148 SqFt lot with views of Fish Ranch and Palo Corona Park. 15 homes sold in this neighborhood in 2015. The most expensive home sold for 3,289,290 for a Mediterranean Villa with Ocean and Pt. Lobos views, 5 bedrooms, 3.5 bathrooms with 5,100 SqFt on 1.2 acres. The least expensive home sold for 595K for a bank owned property with 3 bedrooms, 2 bathrooms, 2,152 SqFt of living space on an almost half acre lot. 16 homes sold in this neighborhood in 2014. The most expensive home sold for 1.675 million for a 5 bedroom, 4 bathroom home with 4,735 SqFt of living space that features panoramic views from the valley to the bay and situated on a half acre. The least expensive home sold for 740K for a bank owned property for a custom home that needs a little TLC with 4 bedrooms, 3 bathrooms and 2,580 SqFt of living space on a half acre lot. In 2013, 18 homes sold with the most expensive home selling for 3.9 million and was a 3,400 SqFt home on 8 acres and the least expensive home sold for 549K and was a 1,640 SqFt home on a 14,374 SqFt lot. In 2012, 11 homes sold with the most expensive home selling for 1.1 million situated on 87,120 SqFt of land, the home features 2,650 SqFt of living space, 4 bedrooms and 3 bathrooms. The least expensive home in the neighborhood sold for 800K, this 3 bedroom, 2 bathroom home had 2,065 SqFt of living space and was situated on a 52,707 SqFt lot. For a detailed analysis of Carmel real estate sales, check out our monthly Community Market Reports. To own a home in Carmel Views/Rancho Rio Vista is to live in a location that offers the perfect balance of peaceful retreat and accessibility. Imagine mornings enjoying coffee on your sunny deck, with only the sounds of the birds and breeze through the surrounding pines. With your large lot you will enjoy fantastic outdoor living and perhaps a sparkling pool to cool off on warm days and to star gaze at night. While your idyllic surroundings may tempt you to stay content at home, you are just minutes to Carmel-by-the-Sea. In this storybook destination spot you can enjoy a wonderful night on the town, seeing a concert at the Sunset Center, dinner at romantic Casanova’s or one of the many stellar restaurants in town. You will enjoy shopping along Ocean Avenue or walking down to Carmel Beach, a gorgeous beach and dog lover’s delight. Your close proximity to Pebble Beach will allow you to take advantage of world class golf and events, and yet still you can venture into Monterey for a stroll along historic Cannery Row or head to Pacific Grove to experience its quaint hometown charms. Less than a mile to Hwy 1, your possibilities for recreation and entertainment are endless. What a superb neighborhood to call home!